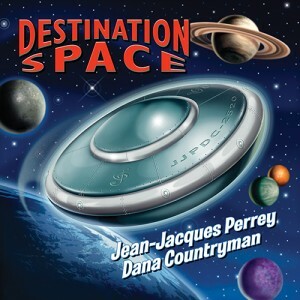 Jean-Jacques Perrey is a legendary pioneer in electronic music, and “Destination Space” is his 22nd album in his long career of many classic Moog and analog influenced albums. He has been sampled or celebrated from everyone from Ice T, Dr. Dre, Fatboy Slim, The Beastie Boys, Smashmouth, Negativland, They Might Be Giants to The Beatles to name a few. Perrey's music partner is arranger and composer Dana Countryman. The CD was recorded in Countryman’s studio in Seattle and blazes new musical territory, this time adding rock and spy themes to their happy-go-lucky space age science fiction tunes. They even get funky with a Moog-ed out dance tune and first single, "Funky Little Spacegirl." "Beyond The Milky Way" is Perrey and Countryman's first song written with lyrics. Always aiming to surprise, the musical duo used computers to synthesize and create artificial voices for the song. The effect becomes an eerie version of "The Carpenters Meet ELO in Outer Space." The Happy Electropop Music Machine is the new Jean-Jacques Perrey/Dana Countryman collaboration. This project is an insanely happy instrumental collection of original tunes which also includes a handful of melodies by other composers. Using classic “Moog” style analog synthesizers, as well as acoustic instruments, the CD is styled to be very retro, and very happy!